Dhaka, Feb 2 (Just News): Three-hundred-and-seventeen runs, for the loss of two wickets. So passed another batting day in Chittagong - a day on which Sri Lanka moved to a position of true strength for the first time in the game, and a day in which a draw became a distinct possibility, such is the absence of wear on this surface. Batsmen prospered more or less relentlessly, and only when the ball was new did it pose them challenges. Bangladesh's bowlers were ground down, two of them now having conceded over a hundred, and a third having given away 97. Fielders were run haggard. Only nine runs behind the opposition now, Sri Lanka have seven wickets remaining, and a shot at establishing a large first-innings lead. 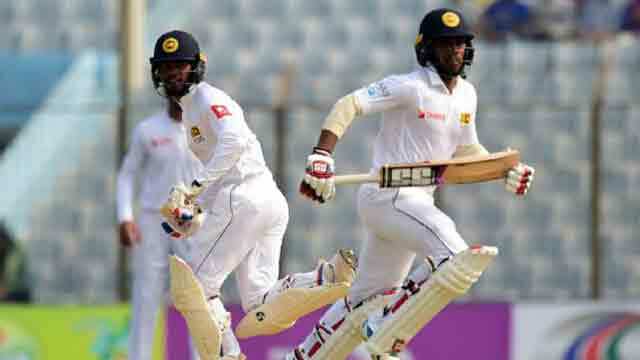 It is to the overnight pair of Kusal Mendis and Dhananjaya de Silva that the first half of the day belonged, and they who ticked off a number of personal milestones during the course of their 308-run second-wicket stand. Mendis completed his fourth Test ton early in the day, before his scoring picked up speed in the afternoon session, and he went on to make 196. Dhananjaya, flowing and assertive (just as he had been on day two), hit a personal high score of 173, during the course of which he became Sri Lanka's equal-fastest batsman to 1000 Test runs along with Roy Dias and Michael Vandort. Mendis too registered his highest Test score, just pipping the 194 he had hit - also against Bangladesh - last year. Once those two had departed, and after Mendis had forged a 22-over, 107-run association with Roshen Silva, the scoring slowed significantly. Dinesh Chandimal batted at his now-familiar laboured fashion, making 37 off 90 deliveries, with only one boundary to his name. Roshen was quicker, but hardly rapid. He went to stumps thirteen runs shy of a maiden Test hundred, having faced 173 deliveries. This was only his third Test innings. For Bangladesh the day was one of missed opportunity. Mustafizur Rahman will feel he should have had Mendis out for the second time in the innings, when Mendis edged a back-of-a-length delivery. That chance, though, split first and second slip right down the middle, and Mendis was given a third reprieve on 83, having also edged wide of a slip fielder while on 4 and 57. Roshen would then have been stumped on 1, had wicketkeeper Liton Das collected a Mehidy Hasan delivery down the legside. Later another opportunity to dismiss Mendis - this time via a run-out - was also bungled. With Chandimal batting so sedately, there were no chances after tea. Bangladesh's only consolation was that they gave away just 88 in the third session, compared to 108 and 121 in the first two. Dhananjaya de Silva was out to a tired stroke and Kusal Mendis squandered another chance to score a maiden double-hundred, but still only three wickets down, and 416 on the scoreboard, Sri Lanka now have a first-innings lead in their sights. The surface has not yet begun to spit for the spinners, and although Bangladesh took the second new ball early in the second session, only modest seam movement was available for the quicks. With a well-set Roshen Silva at the crease, and captain Dinesh Chandimal just having joined him, the hosts will be intent on preventing another partnership from taking root. Failing to strike quickly after the dismissal of Dhananjaya had led to another century stand - Mendis scoring 63 of the 107 runs he and Roshen put on in the space of 130 deliveries. Of the two wickets in the afternoon session, Dhananjaya's was the more forgivable. He top-edged a Mustafizur Rahman ball he was trying to pull from well outside off stump, and the keeper settled beneath the catch. The dismissal was some reward, too, for Mustafizur, who had bowled with excellent intensity all through this innings. At his partner's dismissal for 173, however, Mendis - who, strange as it sounds, had not been completely convincing during the 308-run stand, suddenly transformed into a precise, and punishing strokemaker. It had taken 77 overs and he had scored 119 runs before he ventured his first intentional off-side boundary, but in a flash, the whole field seemed to open up to him. He still prospered mainly on the leg side, often shuffling towards off stump to whip the spinners over the leg-side infield, but now he was also giving himself the option of staying still in his crease to play the late cut, or a drive. Having soaked up 270 balls to get to 136, Mendis' next 59 runs came off 49 deliveries. It was the proximity to a double ton that did him in. Having once before been dismissed in the 190s - also against Bangladesh - Mendis tried to loft Taijul over the leg side once more, to score the four runs he needed for the milestone. He ended up only holing out, sending the ball high in the air, for Mushfiqur Rahim to complete an excellent catch, running full pelt from midwicket. Roshen had a charmed start to his innings, surviving a stumping chance on 1 when the wicketkeeper failed to collect a ball down the leg side. He was tetchy against the second new ball, but eventually settled into his work, and added three boundaries of his own to Mendis' attack. In the morning session, Mendis and de Silva had ticked off a nuber of milestones - Mendis completing his fourth century, de Silva reaching 150 for the first time, and soon after, becoming the equal fastest Sri Lanka batsman to 1000 Test runs. They had only had about eight difficult overs to bat through, before runs began to flow from de Silva's blade in particular. Mendis had offered a half-chance in the early overs of the day, however. Another thick edge from his bat (two such opportunities were missed on day two), perfectly split the gap between first and second slip.